Though it may be tempting to share your cone with your four-legged friend, it's best to avoid giving ice cream to dogs. The first problem with ice cream is that dogs' bodies are not designed to digest milk after they are weaned, as puppies. Since ice cream is made with milk, feeding your dog ice cream could lead to gas, bloating, constipation, diarrhea, or vomiting. The second problem with ice cream is that it is loaded with sugar, and feeding your dog sugary foods can lead to weight gain, which can lead to other health problems. Even if the ice cream says it's sugarless, you need to be careful to read the label to make sure that no xylitol is used, as this sweetener is extremely toxic to dogs. 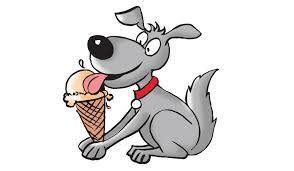 The final problem with ice cream is that some flavors may actually be dangerous for dogs. Chocolate, for example, can be toxic for dogs because their bodies cannot efficiently process a component of the chocolate: theobromine. While not a major danger if given in small amounts as a treat, for dogs with obesity, diabetes, allergies or dairy intolerance, ice cream could be a big problem. Although some dog owners do feed their dogs ice cream, we cannot say that it is a good dessert for dogs, especially when there are other options that are not likely to cause digestive problems. If you want to give your dog a summer treat, frozen yogurt might be a better choice. Because yogurt is fermented, it contains less lactose, so it is easier for dogs to digest. Don't feed your dog a commercial frozen yogurt, since it will be loaded with sugar. Instead, buy a plain, unsweetened yogurt, and put it in your freezer at home. Use caution when giving it to your dog. Although yogurt is easier for dogs to digest, not all canines can tolerate it. Another good summer treat for dogs is "nice cream," a vegan ice cream alternative that is made from frozen bananas. You can easily prepare nice cream at home with only a food processor. This fruit-based dessert is safe for dogs to eat, and it actually provides some nutritional value. The humans in your family might even like it, too! Learn more about other human foods that are and are not OK for dogs here. This article is simply a 'must read' and also one that should be shared as far and wide as possible. Article contains things to look for in a reputable breeder which will help you to make and informed decision. If you are faced with an aggressive dog and just cant get away, here is a method that may help if you have treats on you.